The Effective Exercise Guide for Anyone Suffering from Back Pain or Recovering from Back Surgery. Back pain is one of the most frequent physical complaints, regardless of age or fitness level. 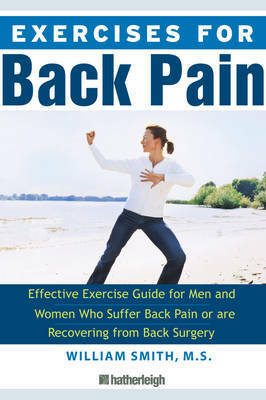 This informative guide includes prescriptive exercise regimes for men and women who suffer from back pain or who have undergone back surgery. Both thorough and comprehensive, it examines the causes and effects back pain has on overall health and well-being as well as offering practical exercise application for treatment. The guide also includes up-to-date medical treatment and a training log for readers to track their progress. William Smith, MS, CSCS, MEPD, has been working in healthcare and wellness, including medically-based exercise therapy for elderly, pre- and post-rehabilitative, and special needs clients for many years. Will is a recognized national expert in health and wellness and has lectured at recognized centers of wellness including Canyon Ranch. Will currently teaches at UMDNJ Physical Therapy at Rutgers University and works for a top-rated healthcare system in New Jersey.